The Body Shop Virgin Mojito Body Sorbet | The Body Shop Passion Fruit Shower Gel | Clinique Moisture Surge Face Spray | The Body Shop Glazed Apple Bath Jelly | Ghost Eclipse Perfume | The Body Shop Honey Bronzer | Fresh Sugar Coral Lip Balm | NYX Lip Gloss | Laura Mercier Foundation Primer | Deborah Lippmann I'm A Flirt Nail Polish | Barry M Satsuma Nail Polish | Colour Club Reign In Spain Nail Polish | Barry M Blueberry Nail Polish | Barry M Blue Grape Nail Polish. As I mentioned in my Spring Edit, I'm definitely more of an autumn and winter person than spring or summer. Give me snow and cold weather anytime. The heat irritates my eczema and my skin burns to a crisp at just the sight of the sun. 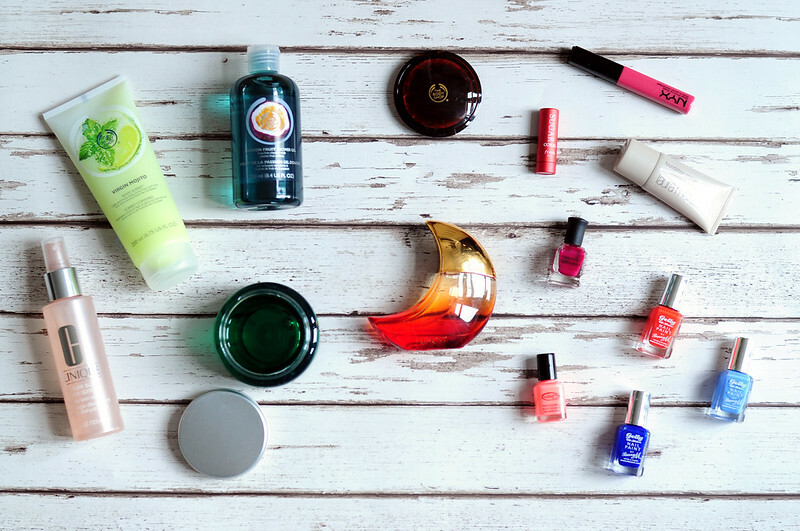 I try to get more excited at the prospect of the summer months by using fruity smelling products and bright nail polish colours. Facial sprays and cold baths are also another essential for me in the summer months. I don't take many long baths in the summer months, but I still like to use a lot of bath products. I received The Body Shops Virgin Mojito range for my birthday in June and I've loved using them. I've only included the body sorbet in the photo, but I also have the shower gel and body scrub. The body sorbet is different from any other body moisturiser I've tried. It almost feels like a shower gel when you first apply it. It sinks in incredibly quickly which is a huge bonus for me as I hate the sticky feeling when you put your clothes back on. The scent is also heavenly and makes me want to have a mojito every time I use the products. I've also been loving The Body Shops Glazed Apple Bath Jelly for when I do want a slightly longer bath. Although this was released around Christmas time last year, I personally think it's more of a summer scent so it's why I've only just started using it now. I also pair this with the shower gel and body scrub. What I love most about perfume, apart from obviously smelling nice, is how they can bring back so many memories. I tend to buy a new perfume each time I go on holiday so everytime I smell those perfumes again I recall all those happy times. This particular perfume from Ghost reminds me of Barcelona a few years ago with my parents. It was my first time visiting Spain and a city that I loved from afar. Gaudi was a huge influence in my GCSE and A Level art work and it was amazing to stand in and walk around the buildings he designed.